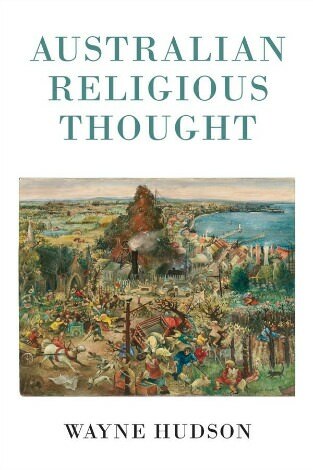 In light of the publication of his new book Australian Religious Thought, the polymath Wayne Hudson has asked me to offer a few reflections on post-secular consciousness in my capacity as a religious person regularly involved in the public square of a pluralist democratic polity. Like many of you, I have had cause to reflect these last few weeks on why Cardinal Pell evokes such a visceral reaction from so many Australians who profess to have no religious commitment whatever, especially some in the media. Of course Pell is often portrayed as the embodiment of tradition and authority of institutional religion. But whatever his shortcomings in relation to dealing with child sexual abuse, this does not fully explain the deep passion of so many of the anti-religious and non-religious factions. He is also perceived by many of his critics as lacking the empathy, the compassion, and the insight of one who is supposed to tap into the religious sensibility or the secular moral consciousness of the average Australian who never darkens the door of a church but who often enjoys the benefit of hindsight. Now I offer no public judgment of Pell, and unlike many other commentators I will await the findings of the royal commission. I have however been outspoken about his right to a fair hearing and to natural justice — not because he is a religious leader, but because he is a citizen. And of course, some have responded, 'Brennan would say that, because he is a Catholic priest.' No I say it because I am a human rights lawyer who cares about the universal application of the rule of law. It is when a representative of institutional religion like Pell taps into the generic religious sensibility or moral consciousness that the real work of Australian religious thought is done. Australian religious thought is not just the thought of those Australians who are religious. It embraces the thought of those non-religious others who reflect on the lives of those who are religious. Some years ago, when launching the second edition of Philip Adams' Adams v God, I made the point to Philip: 'For God's sake, don't come across; as a believer, you would be a crashing bore. I think you do great work from where you are on the other side of the fence.' Programs such as Philip's LNL make a great contribution to Australian religious thought. All persons are seeking an articulation of the sacred in their lives, whether or not they espouse religious beliefs with ecclesiastical verification. We Australians are now well used to laws and policies aimed at protecting sacred sites and recognising Aboriginal spiritual relationships with lands and waters. We regularly commence formal public events with an acknowledgment of country, ancestors, spirits, and elders past and present. These are public expressions of Australian religious thought which are politically acceptable even to those who eschew all notions of spirituality in their own lives. "Religious language spoken by these secular practitioners can help the community to focus on ethical imperatives crafted for a society in which no one dares to posture publicly as being religiously righteous." 'Over the generations, we have reached out across those trenches that divided us. We have embraced a more sustaining myth, a more noble ideal: the brotherhood of man, the dignity of our shared humanity. I have just returned from the 40th Port Fairy Folk Festival which is a gathering place for many deep practitioners of Australian religious thought, though not many of them attend the annual folk mass or equivalent celebrations hosted by the other Christian denominations. Many of our finest novelists are exemplars of Australian religious thought. Think only of David Malouf, Tim Winton, and Helen Garner. They tap into notions of community and the sacramental — without the ecclesiastical trappings of tradition and authority. It's the lived experience rather than the learned book reading which regularly forms the basis for Australian religious thought. Religious language spoken by these practitioners can help the community to focus on ethical imperatives crafted for a society in which no one dares to posture publicly as being religiously righteous. Jesus said: 'What shall it profit a man to gain the whole world only to lose his soul?' And I wonder: What does it profit a people to do likewise, to shun the weak and punish the oppressed, to cage children, and make criminals out of refugees? What about our soul as a people? We're losing our way. We have hardened our hearts. I fear we have devalued the currency of mercy. Children have asked for bread and we gave them stones. So turn back. I beg you. For the children's sake. For the sake of this nation's spirit. Raise us back up to our best selves. Turn back while there's still time. These words would not have resounded around the nation so throbbingly if they had been uttered by someone in clerical dress or by someone affecting a liturgical tone. Here is religious thought clothed in non-religious apparel and worn by one of non-religious appearance. Hudson portrays many diverse Australian religious thinkers in this expansive book. One is Max Charlesworth whose intellectual humility was fostered by a commitment to inter-disciplinary study, conversation and writing. Charlesworth developed personal friendships with people of all backgrounds moving 'beyond confessional confines and (becoming) an advocate of interreligious theology for whom there could be no established morality in a liberal society'. Hudson makes the point that Charlesworth 'without abandoning his personal Catholicism, embraced the more stringent implications of pluralism within the framework of liberal political philosophy'. Another thinker highlighted by Hudson is the ethnographic historian Greg Dening. Reading the account of Dening's 'epistemology based on theatricality and participation, as opposed to positivist conceptions of the sciences', I recalled Dening's wonderful essay 'Living with and in deep time' published in Stuart McIntyre's edited collection The Historian's Conscience: Australian Historians on the Ethics of History. Dening recalled the celebration at the National Library in Canberra when two items of Australian heritage were placed on the Memory of the World Register. Those items, joining documents from other countries such as the Magna Carta and the US Declaration of Independence, were not the Australian Constitution or even the batting records of Donald Bradman, but rather Captain James Cook's journal from the Endeavour voyage of 1768-1771 culminating in his hoisting the flag on Possession Island, and the papers relating to Eddie Mabo's case in the High Court. He (Mabo) taps a truth the way we all tap truths from living, but in ways which need to be tolerated by those whose notion of law and evidence is blinkered by legal tradition and constitution and who need to find some entry into Eddie Mabo's otherness. The other papers in the Mabo Papers — of judges, lawyers, anthropologists, historians, witnesses of first people telling their stories — belong to the Memory of the World because the whole world faces the issue of how it lives with the Deep Time of all its first peoples, overrun and dispossessed as they are. It belongs to World Memory because the papers are we, the Australian people, struggling to do justice and to live with the Deep Time all around us. And we are in this instance the world. The postsecular consciousness is our 'struggling to do justice and to live with the Deep Time all around us'. It is the stuff of Australian religious thought. McIntyre challenged Hudson 'to make better sense of how the patterns in Australia compared with those in other settler societies'. As a first step, Hudson has 'brought together a substantial body of research and interpreted some of it in innovative ways'. For this, we contributors to Australian religious thought are in his debt, whether or not we count ourselves as religious. Talk about arrogant! Brennan (and presumably Hudson) conflates plain old kindness, decency and respect with "religious thought." As an atheist, I find that an insulting notion. It seems to me that some people are clutching at straws. Just because those who engage in ‘religious thought’ often display ‘plain old kindness, decency and respect’, that is no reason for an atheist to be insulted, thinking they are wrongly conflated. Of course atheists can also display ‘plain old kindness, decency and respect’. Some of us who engage in religious thought would not be able to display these admirable characteristics as often if we were not to engage in religious thought. There’s nothing arrogant in that. I have long admired those atheists who consistently display ‘plain old kindness, decency and respect’. I am not a scholar so maybe I should not even try to weigh in on this subject again. Although I am trying hard not to be obtuse, I just cannot understand Father Brennan's response to my previous comment. Did he not say in his article that "We Australians are now well used to laws and policies protecting sacred sites and recognising aboriginal spiritual relationships with land and waters. ...These are public expressions of Australian religious thought..." I am sorry Father, but sez who? For me and I suspect most Australians, they are nothing of the kind. And while I am at it, I take exception to your extraordinary statement that people who engage in religious thought are more likely to display kindness, decency and respect than those who do not. Wow, Father. Did you really mean to write that? Did you, Frank, really expect any other reaction than the one you got from John? The 'visceral reaction' to George Pell comes not only from those that you describe as 'the anti-religious and non-religious faction' but also from those, within your church, like Moira Rayner and Kristine Keneally, who are actually prepared to speak out. Being ‘not as other men are’, you ‘offer no public judgement of Pell’ but continue to be outspoken about his right to a fair hearing, as if there was any danger he might receive anything less from the Commission. By this time you have lost most of us, before you tackle the important but contested notion of a ‘post secular consciousness’ and the concept of the sacred in a secular society. Then you seem, to me at least, to want to take a gradually growing but by no means universal respect for indigenous culture, and conversely a growing tendency for the Anzac myth to be morphed into a dangerous national religion by people like Abbott and his sabre-rattlers, as a sign of ‘religious thought’ among the non-religious other, when most of the time it is anything but ‘religious’ and much more to do with John’s ‘plain old kindness, decency and respect’. It was considered a truism in the upheavals of the 1960s that all actions and the thoughts that underlie them are political. Perhaps. as someone who reflects at some depth on religion as well, Fr Brennan merely observes that actions and thoughts similarly all have a religious dimension. While it seems to suit many -- atheists in particular -- to define "religious" in a much more narrow sense, that is the kind of thinking which, by its nature, drives religious division and perpetuates disharmony. As to the morality of religion or non-theistic people, while I have certainly come across people who think religion provides moral superiority, or, more accurately people who think people think religion provides moral superiority, it is hard to see that as Brennan's view when he talks about "ethical imperatives crafted for a society in which no one dares to posture publicly as being religiously righteous." After all, that understanding of righteousness originally derived from Christian teaching has long escaped the confines of churches and become the common currency of the west.